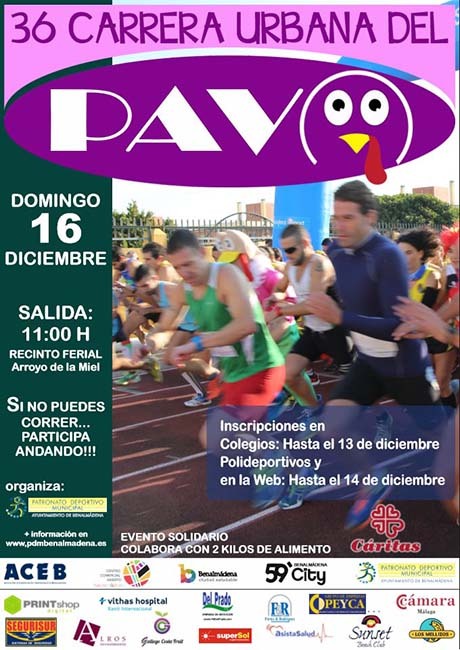 Arroyo de la Miel is getting ready to celebrate the 36th edition of its famous ‘Carrera Urbana del Pavo’ (Urban Turkey Race) which will take place on Sunday the 16th December, 2018. The main aim of this Urban Turkey Race is to promote running amongst participants and the local population, fomenting a healthy lifestyle through this wonderful form of exercise. This year the event will also be collaborating closely with local charity, Caritas, to help families in need; all runners taking part in the race are asked to donate 2kg of food. With a bit of luck, we’ll see participation numbers similar to last year which will allow for the collection of thousands of kilos of food! The race consists of two circuits, a 4.7 km long circuit and a shorter 1.7km for kids and disabled athletes (see map below). Both circuits start off at the Fair Ground next to Paloma Park and make their way through the streets of the town to the finish line once again at the Fair Ground. The fun starts at 11:00 am and all those who wish to take part will have to sign up by the 14th December (at the Municipal Sports Stadium). Runners of all levels and ages are welcome as the race will have 18 categories and their corresponding prizes.